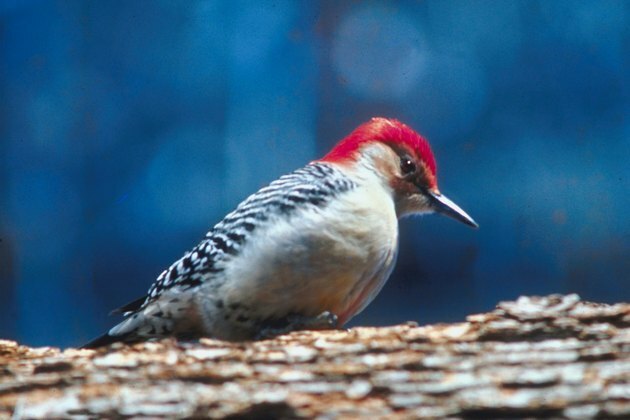 The United States is home to 22 species of woodpeckers. The birds drill into trees using their beaks to harvest sap, bugs or bore out a cavity for nesting. Trees are rarely seriously damaged by a woodpecker unless the tree is already sick or suffers from a bug infestation. However, woodpecker damage on a beloved tree should be promptly repaired to avoid disease from penetrating the tree. The sapsucker woodpecker tends to do the most damage to trees in its quest for sap. Check the health of the tree. Evaluate if the tree has a bug infestation or not. If there is a bug infestation then identify the bugs and promptly spray the tree to control the bugs before you repair the woodpecker holes. Wash tree wounds with simple soap and water. A liquid dish soap works the best. This will help reduce the amount of pathogens that might have been introduced into the tree by the woodpecker,s beak and claws. Be sure to thoroughly wash all soap from the tree's wounds using water. Once the tree is thoroughly washed, allow all scratches and small wounds to heal in the open air. There is no reason to damage small tree wounds. Tape any bark that has become dislodged by the woodpecker using simple duct tape or strapping tape. Leave the duct tape over the loose bark wound for three months and then check the damage to see if healing has occurred. If the wound is still in the process of healing, add more duct tape or strapping tape and wait an additional three months. Once the damage is healed completely, remove all the tape. Clean any large cavity that a woodpecker has made with soap and water. Remove any debris. Screw or nail a piece of tin or window screen over the cavity to prevent the woodpeckers from returning. If the cavity is severe and will fill with water when it rains or snows, then drill holes into the lower half the cavity so the water can easily drain. In time, the tree will heal itself, but the woodpecker and other pests must be kept out of the cavity. Place tinfoil around the tree where the woodpecker damage has occurred. Tinfoil helps scare woodpeckers off so the tree will not sustain more damage. Fasten sticky bird repellent sheets around the trunk of the tree to discourage the woodpeckers from returning. Can Ants Kill Maple Trees?